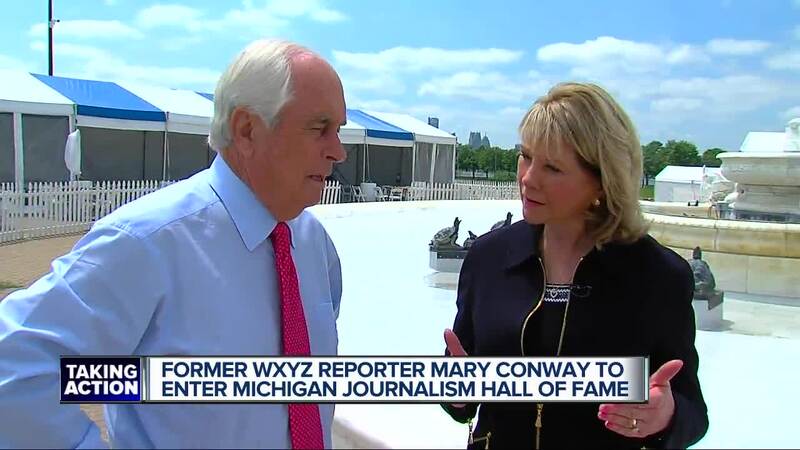 EAST LANSING (WXYZ) — Former WXYZ reporter Mary Conway will be inducted into the Michigan Journalism Hall of Fame on Sunday. Conway, who set the standard for automotive and business coverage throughout Michigan, spent nearly 30 years at WXYZ-TV following stops at WZZM in Grand Rapids and WIFR in Rockford, Illinois. “I am deeply honored and humbled to be included in the Michigan Journalism Hall of Fame,” Conway said today. “I am fortunate to be honored for doing a job that I loved. I can’t thank Channel 7 and its viewers enough! It was such a privilege to be part of the WXYZ team." Throughout her 29 years at WXYZ, Conway covered some of the most significant stories in Detroit’s history, including Nelson Mandela’s visit to the Motor City, the bankruptcies of General Motors and Chrysler and the elevation of Cardinal Adam Maida in Rome in 1994. Conway would return to Vatican City in 2005 to report on the passing of Pope John Paul II. Known for her relentless coverage of the automotive industry, Conway was respected by viewers—and feared by competitors—for her knack for breaking the biggest stories about Detroit’s Big Three. Throughout her career, she traveled to countless auto shows throughout the world and was a fixture at the North American International Auto Show in Detroit and the Woodard Dream Cruise every August. Conway will be inducted into the Michigan Hall of Fame on April 14 on the campus of Michigan State University.